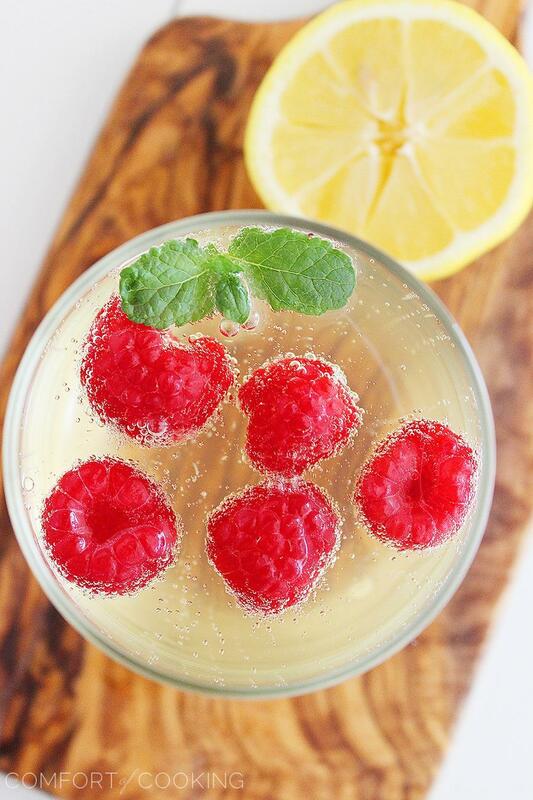 Kick back and relax with a sparkling summery sip… bubbly, lemony Prosecco with fresh raspberries and mint! It’s Friday. Let’s wiiiiine down a little bit, shall we? Oh, it’s “wind” you say? Nope, not in this house. Fridays are all about tossin’ out my to-do list, lettin’ my hair down (at least for me – sorry, hubby! ), and pouring an icy cold glass full of my favorite cocktail. Prosecco, I love you. You + me = forevah. Our love affair began shortly before my wedding, when my mother-in-law introduced me to the fabulous, fizzy drink. We wanted something to serve other than champagne (never been a big fan), in walked Prosecco, and we’ve been inseparable ever since. After all, champagne is way too classy to be followed by the big, bubbly burp it leaves in your throat. One minute you’re sipping away and feeling all fancy, then the next you feel bloated and “full”… Or maybe it’s just that I’ve only ever drank cheap champagne. Yep, that’s probably it. A few fun tips – To keep your cocktail cold, freeze your berries 10 minutes before serving for berry “ice cubes”! If raspberries aren’t your thing, go for strawberries, blackberries, blueberries, or cranberries for a holiday season spin. You can even muddle the berries in the bottom of the glasses to really bring out their flavors and colors! For an end-of-summer sip, it doesn’t get any better than this cool, refreshing cocktail with fragrant fresh mint. If you like your drinks sweeter, add more limoncello – a thick, lemony vodka syrup – or if you like ‘em dry like me, just a little does the job. Here’s my easy all-natural recipe for homemade limoncello… we enjoy it in many cocktails year-round, and it makes a great gift. At least 15 minutes before serving: Chill four wine/cocktail glasses in the freezer or refrigerator. Place raspberries on a plate and freeze. 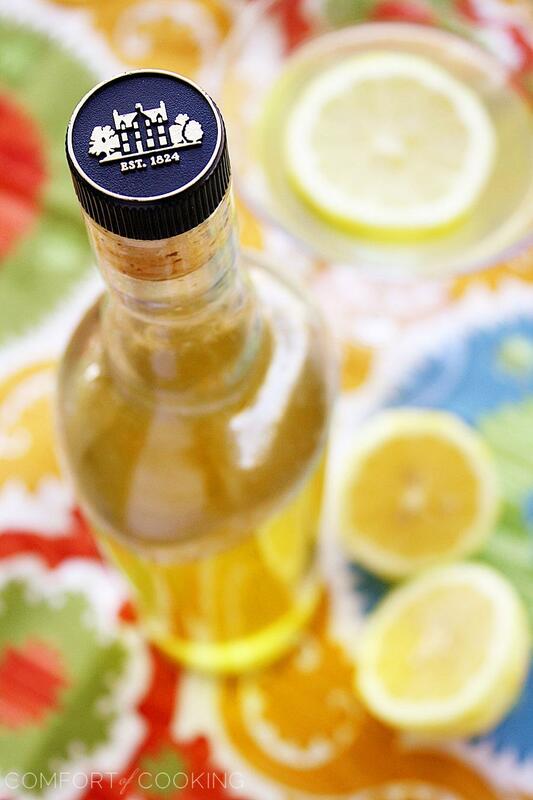 Remove chilled glasses, add limoncello (1 oz. each), and top off with Prosecco. Add raspberries and mint leaves. You can substitute the sparkling wine for lemon-flavored sparkling mineral water for a non-alcoholic refreshment! Add more or less limoncello, according to your tastes. Instead of raspberries, go for strawberries, blackberries, blueberries, or cranberries for a holiday cocktail. You can even muddle the berries in the bottom of the glasses to really bring out their flavors and colors! Store limoncello in your freezer. It won’t freeze solid because of the high alcohol content. Disclosure: I was provided with product for review, but all opinions are my own. I didn’t think you could beat a cold glass of prosecco but I think you might just have done that with this cocktail. Beautiful! Gorgeous! Love your styling and photography for this special cocktail, Georgia. You even captured those tiny bubbles beautifully. I just adore Prosecco and your Limoncello cocktail looks so refreshing. Thanks for sharing and have a wonderful Labor Day holiday weekend! I think I need a big glass of this before we hit the road to travel this long weekend – hello traffic! Maybe one of these will get me through that : ) Have a great holiday weekend! This cooler has so many of my favorite ingredients, and yet I never thought to combine them. And using frozen berries as ice cubes is a great suggestion! The Ruffino Prosecco sounds amazing — will have to hunt that down. Sounds like it could make the perfect Bellini. Oh it is so pretty! It’s late on Friday night here and I think this would be the perfect drink for right this minute. It’s so pretty with the berries. Lurv prosecco! This looks fantastic for the upcoming holiday weekend. Cheers! the only thing that stands between me and this drink is 8 hours of work. BRING IT ON! This looks so good and refreshing. Lately my family and I have been using Prosecco in our mimosas instead of champagne, so I definitely have some on hand to make your recipe. Love it! this is the best way to start off your weekend. Prosecco is my drink of choice. I love it. I can’t get enough of it. I really believe it to be the bubbles. I love bubbles in all of my cocktails. It’s the happy effervescence–I think. Either way, this drink looks fabulous. It’s going on my cocktail rotation. It looks so refreshing and beautiful! I love these photos, so refreshing looking. What a great sip to end summer with!! This cocktail looks divine, and I would love one. Who am I kidding, one wouldn’t be enough! I love Prosecco, so this one’s getting pinned. Lovely pics, Georgia! That Ruffino sounds right up my alley and this cooler sounds like it would be very welcomed by my throat :) Cheers to a great weekend. These are some GORGEOUS photos – that last one from directly above captures the bubbles so well – wow! This is so pretty and the pictures are so good! This is a lovely cocktail to enjoy with a little nibble before dinner. On this eighty degree day, I definitely need one of these drinks. This libation has summer home run written ALL over it! Wow!! Beautifully done. Such a pretty cooler! Love the Prosecco and those raspberries are gorgeous! 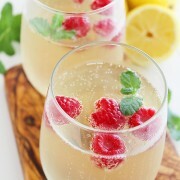 I love prosecco and this cocktail looks SO fantastic – perfectly refreshing for summertime! I am thiiiirrrrrrsty! This is a nice drink for this long weekend, and gosh your drink looks so refreshing! This looks so refreshing! I would love a glass on the porch right now! Love prosecco, too! Makes me think of my sister, who loves a good refreshing drink like this! ; ) It’s just beautiful, which makes it all the better! What a beautifully refreshing drink ! your photos are simply gorgeous! You’ve never tried Prosecco? Oh, that needs to change! You’d love it, Eileen! Have a great weekend. How gorgeous is this?! I also love the berry ice cubes tip! An absolutely beautiful way to enjoy a good cocktail on a Friday evening. Love it. I love prosecco! This look ah maze ing!!! I love fun, simple drinks like this! I’m sort of a baby when it comes to hard alcohol–so I much prefer a wine or champagne/prosecco based cocktail. Love the addition of limoncello and fresh raspberries. I went to the Limoncello capital-the Amalfi Coast in Italy–a few months ago and it was EVERYWHERE. So divine. It is hot, hot, hot here in Nashville and I think your Prosecco cooler is just what I need late this afternoon. I have all the ingredients…thanks…what could be cooler? I never drink alcohol but this cooler looks so amazing that I’m thinking about giving it a try. It’s such a pretty drink, I love the color! You’re a girl after my own heart, Georgia! 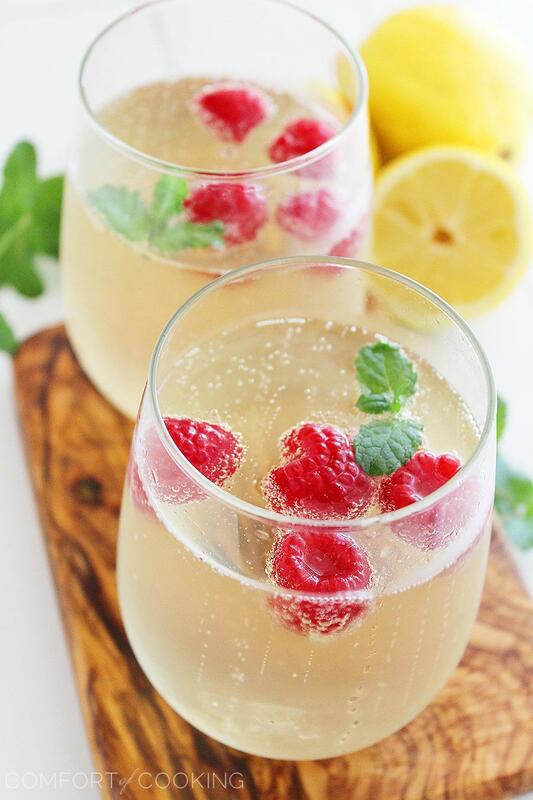 I love prosecco and this looks so refreshing and perfect! I love Prosecco better than champagne too! I’m excited to try this and with some extra home are bottles of Limoncello sitting around this sounds wonderful. I haven’t tried that brand of Prosecco but will look for it. Sliced peaches might be nice to add as well especially since it has hints of that flavor. Thanks for sharing. Hi Georgia, I’m making this cocktail tonight! I have a bottle of Limoncello that’s been waiting for a companion and Proseco is just the ticket! I love this idea. Great summer drink. Thanks for sharing! you’ve photographed it in a fancy way too! I NEED to make this before summer is over! This looks so refreshing! Love the top picture! Great recipe, too. I’m always up for a nice, refreshing cooler when it’s hot (and yesterday was 101 F!!!!!). This looks perfect – thanks. Looks so lovely and refreshing! Looks wonderful. I wish I had some right now although I definintely might try to make some of your Limoncello..love it. Last time I had homemade it was in Little Italy in Boston – so good! I’m a giant fan of limoncello (and Prosecco) so this sounds so appealing to me. Great idea to freeze the berries to make the into ice cubes! Georgia!! This sounds so delicious and refreshing! Love it.. Pinned it to multiple boards on pinterest.. BTW we wanted to invite you to a group board but for some reason we can send it to you. If you give us your email, well send you the invite. Hi lovely lady! This looks so very refreshing. I wish I wasn’t breastfeeding! I could “pump and dump” but I’ll probably just bookmark this recipe and save it for next summer. Thank you for sharing, sweet friend. I hope you are having a good start to your week! What a fun drink Georgia, this looks refreshing. I also like the idea of freezing the berries before adding them to the drink to keep them cold ! Glad you enjoyed the my cocktail; it’s been a huge hit with friends, family and readers; especially the use of frozen fruit in lieu of ice cubes. Works with strawberries and blueberries too. EEK! Those photos? BUBBLES? I can’t even make coherent sentences. I’m a huge Prosecco girl. This needs to happen ASAP. WHOA! These pictures are amazing. Especially the last one. I can hardly believe it’s real. It’s just so incredible. I love this recipe! But I’m worried that I won’t be able to find Prosecco. Where did you buy yours? You can find it at any liquor store or large grocery store near the champagne. Even my Super Target carries it! Another cool drink for the hot season. I love this one. Thanks for the recipe!! I can’t wait to try this-espcially since some of my favorite cocktails are made with prosecco. Have you ever tried the brand La Marca’s Prosecco? It is pretty amazing(and also very highly rated!) I will have to hunt down Ruffino’s prosecco and try it for sure! Ruffino also makes an absolutely fantastic moscato too-you should try it if you like bubbles. It’s not too sweet and not overly bubbly,-has the perfect balance. La Marca is one of my favorites! Glad to hear from a fellow Prosecco lover! Woww!! Looks like amazing!! will do it next weekend for my wife! She will love it, specially because of the raspberry! Thanks Georgia!! What a delight. Seems to be well frescante. I’m not a cook I like to enjoy the wonderful foods!